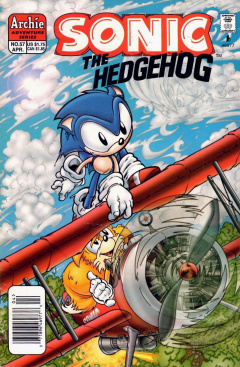 Sonic the Hedgehog 57 is the fifty-seventh issue of the Sonic the Hedgehog comic. This issue features one story, titled "Back to Basics... or the History Device"
A Special Note: This story is essentially a recap of previous issues. Only the events exclusive to this story will be summarized. The Freedom Fighters, Jules the Hedgehog, Bernadette the Hedgehog, Uncle Chuck, Geoffrey St. John, and Doctor Quack watch Sonic as he packs in preparation to pursue rogue sorcerer Ixis Naugus, accompanied by Miles "Tails" Prower. Sally expresses amazement at Sonic's decision, and Sonic replies that he's uncertain about facing the sorcerer as well. Rotor enters excitedly. It seems he's found a device built by Dr. Robotnik in an old lab. Uncle Chuck warns that messing with a Robotnik-designed gadget is not a good idea, but after Rotor reveals that the device is intended to let the wearer see into his own future, Sonic is eager to try it on. Sally protests, but he argues that this'll let them get a jump on Nauges if it works as advertised, so she reluctantly relents. He powers it up, and finds that indeed it does not work the way it was designed. Instead, it only shows the wearer their past. What follows is a recap of the events preceding Sonic #57, beginning with Robotnik's coup. Every major prior story and special contains its own panel with a brief bit of dialog summary from Sonic's perspective. But as the present approaches with the defeat of Master Mogul as the restoration of King Max Acorn's body, the history device sputters and overloads. Sonic promptly removes it from his head and tosses it outside, where it explodes. Sonic is bummed that now he won't get the chance to know where Naugus will be, but Uncle Chuck comforts him, saying that if the device had worked as advertised, none of them would even be around today to talk about it. Finding some consolation in that, Sonic takes the opportunity to have one final talk with his parents before his departure. He apologizes for avoiding them until now, and not expressing his happiness for their return into his life. Bernie briefly nags him, but Jules mentions that he's gotten along just fine without them all these years, and he shouldn't need them now. Sonic promptly shoots down this notion, and gives the two a big hug goodbye. Sonic briefly joins Sally to take the opportunity to tell her that she rules in the biggest way, and that he considers her his best friend on Mobius. Sally asks him when he'll come back, but Sonic doesn't know, so instead he gathers a quick bouquet of flowers and tells her she should take the opportunity to get to know her dad better; and not change. She kisses him on the head. They get to the outskirts of Mobotropolis where their bi-plane resides, its new name "Winged Victory". Sonic questions whose idea that name was. Sally states that it was the decision of the Mobotropolis High Council... A council which Sonic himself is a member of. Embarrassed, Sonic starts the plane and takes off. Rotor is concerned about who is going to take Sonic's place on the council. Sally tells him not to worry; they'll manage without him.